Have you tried computer dating, but found discouraging results? Do you have a profile languishing, forgotten and ignored, on a dating site? 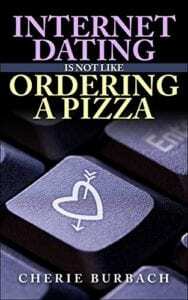 Have you given up on computer dating because “all the good ones are taken?” Well, have I got the book for you! Internet dating consultant Cherie Burbach’s Internet Dating is Not Like Ordering Pizza may change your dating life, or if you have Ms. Burbach’s luck it may end up changing your entire life. She met loads of great guys through online dating, one of whom she ended up marrying! In a reassuring, upbeat tone, this author provides an easy-to-follow formula to help you present yourself well online. Her style is chatty and friendly without being at all cheesy or condescending. Burbach provides straightforward, easily applicable advice for successful internet dating. Internet Dating is Not Like Ordering a Pizza covers all the bases: writing an eye-catching profile essay (for example, “Don’t call yourself a ‘hopeless romantic’” and please don’t mention walking on beaches! ), picking winning photographs to post (No kids! ), writing the perfect headline (the examples of bad ones and her snappy comebacks are hilarious), honing your search criteria (cast a wide net), exchanging email messages with potential dates (like how to come off as open but not desperate), finding a good match, smart and safe rules for the first date (she’s a big fan of the 60-minute coffee shop date), online dating etiquette (like how to let someone down easy), and developing a good online dating attitude. Burbach also offers some good and solid “Dear Abby” -styled advice on circumstances under which you should not enter the world of internet dating (for example, if you haven’t gotten over your ex. ), as well as how to stay positive, how to move on from a hurtful relationship, and how to avoid coming off as an online stalker. If you are at all interested in being more successful at internet dating, then I heartily recommend this book. And if you happen to be new to internet dating, you also may want to pick up Burbach’s previous book At the Coffee Shop, a humorous introduction to online dating. Plus, check out all the cool articles on her website at www.thedifferencenow.com to shake up and refresh your dating life. Quill says: Single folks who are ready to meet a lot of great people should pick up this book. At the very least, it’s a fun read. At the very most….it could lead to true love!